J.K. Rowling's Wizarding World is full of magical curiosities: a flying car, a hat that sings, an enchanted case, and so much more. This deluxe pop-up book showcases three-dimensional renderings of some of the beloved curiosities from the Harry Potter films and the movie Fantastic Beasts and Where to Find Them. Pull out flaps will feature text that delves into the items on each spread and how they were achieved in the films. 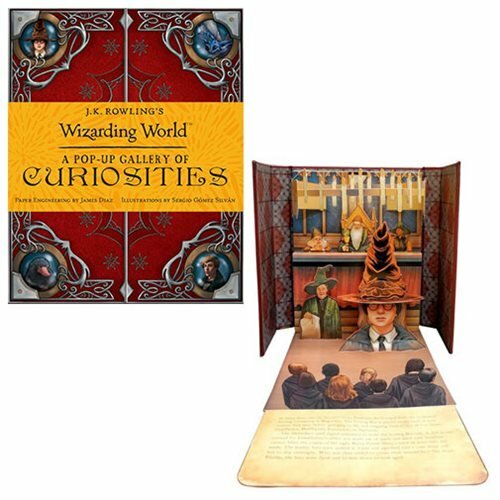 The J.K. Rowling's Wizarding World: A Pop-up Gallery of Curiosities Hardcover Book features doors that open from the middle of the front cover, a sturdy magnetic closure, and elastic loops to hold each pop firmly in place making it a perfect stand-alone display. This 10 page book measures about 8 1/10-inches tall x 6 3/5-inches wide. Ages 8 and up.